Bonn, 3 July 2017 - the 41st session of the World Heritage Committee is taking place in Cracow, Poland from 2 to 12 July 2017. Like every year, the representatives from 21 States Parties to the Convention concerning the Protection of the World Cultural and Natural Heritage will identify, based on nominations submitted by States Parties, cultural and natural properties that need to be protected and decide which of those will be added to the World Heritage List. Recently, the Yellow Sea of China and the Bohai Gulf were put on the World Heritage Tentative List. The extensive mudflats, sandflats and associated habitats of the Yellow Sea, including the Bohai Gulf are suffering from rapid destruction. These areas represent one of the largest intertidal wetlands on the planet. It is the most important staging area for migratory waterbirds in the East Asian-Australasian Flyway (EAAF). But not only migratory birds depend on the stability of this ecosystem; it is also an indicator of the vital ecosystem services provided by the Yellow Sea, including, fisheries, disaster risk reduction and climate change resilience. About 200 million people live in the coastal area, where many rely on the regional economy for their subsistence. 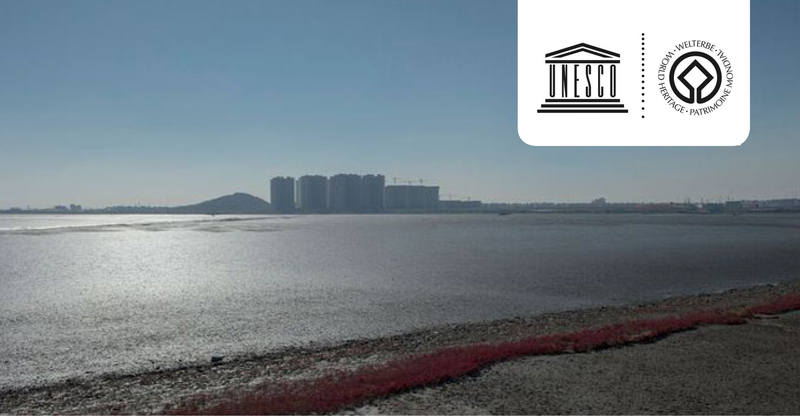 All those concerns led to a call for recognizing the emergency for the conservation and management of the intertidal wetlands of the Yellow Sea, including the Bohai Gulf. A remarkable parallel to the Yellow Sea already exists in Europe along the East Atlantic Flyway, where the tidal flats of the Wadden Sea, extending along the North Sea coasts of Denmark, Germany and the Netherlands, also serve as a vital stopover site for millions of migratory waterbirds. This area is already recognized as a trilateral transboundary UNESCO World Heritage Site, indeed the first ever transboundary World Heritage Site comprising an intertidal area and one of only two such World Heritage Sites worldwide. The second area of this kind is the Banc d’Arguin in Mauritania, which is also located on the East Atlantic Flyway. Intertidal mudflats are unique and fascinating ecosystems that deserve protection in their own right. However, as in the case of the Wadden Sea, which obtained the World Heritage status in 2009, the significance of the intertidal mudflats of the Yellow Sea extends far beyond the limits of the area itself. As a key staging area for migratory birds along the East Asian-Australasian Flyway they are critically important for biodiversity on a global scale. The Common Wadden Sea Secretariat therefore welcomes the initiative to inscribe this site on the UNESCO World Heritage List and we hope that it will contribute to reconciling nature protection and regional development in this vital and vulnerable area. The decision to add the Yellow Sea of China and the Bohai Gulf as World Heritage sites would be an important step to help protect these important ecosystems for the benefit of wildlife and people alike. For more information about the nominated sites, please visit the UNESCO World Heritage website.